Location: Situated in front of Holy Trinity Church on the N side of Gwernaffield Road close to its junction with Church Lane. 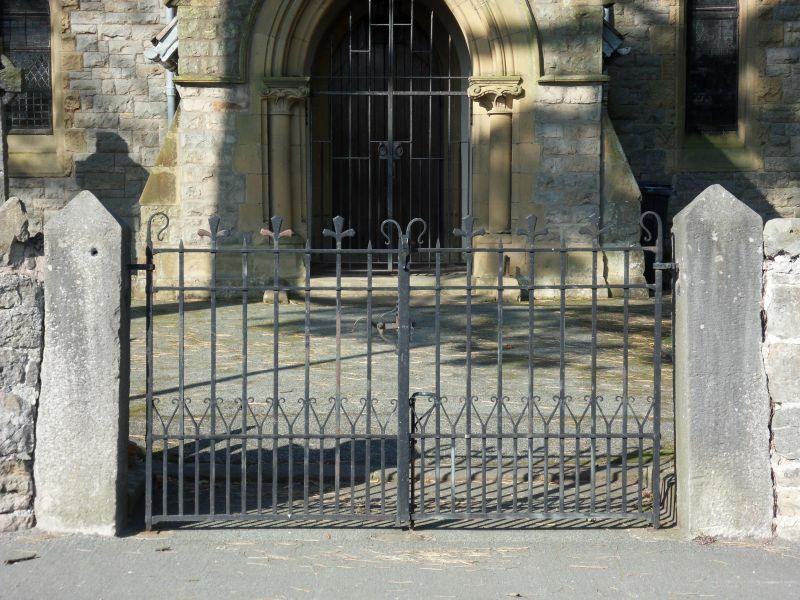 The gates were made from ironwork relating to chancel gates taken c1850 from St. Mary's Church, Mold. They had probably been designed by Robert Davies in c1726 or by Thomas Cheswise who made a matching set in 1732. Restored late C20. Pair of wrought iron gates set into stone piers. Wrought iron scrollwork cresting to top of gates with gilded foliated finials and scallop designs. The bottom rail has a set of smaller standards with foliation and spearhead finials. Listed as a fine example of earlier C18 ironwork with local historical associations. On the E side of Gwernaffield at the end of a short drive leading south of a minor road from Mold. The coach-house is located immediately to the W of the former Vicarage. On the E side of Gwernaffield at the end of a short drive leading south of a minor road from Mold. Situated up a rough track which runs S from the Crown Inn on the by-road from Pantymwyn to Mold. Situated in the garden of Towerside reached from a rough track leading N off Pant-y-buarth Road. Located off Hafod Road to the W, set in its own park and approached via a private drive. Situated 500m west of Rhual set into the earth. Reached from a drive running N from the Mold/Gwernaffield by-road.